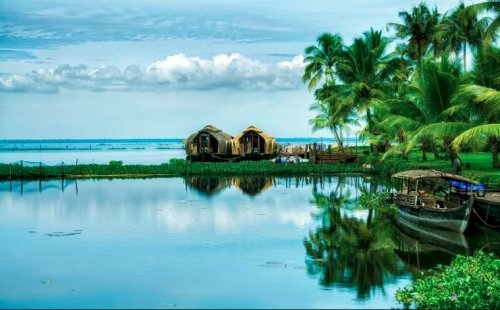 Join Kevin Scully on a 14-day painting holiday to the beautiful Kerala region of India, where you will be truly spoilt for subjects to paint. We will visit four very distinct regions that will provide you with many authentic experiences to take back home with you. For the first part of the trip we will be based for 5 days at our hotel in The Backwaters area. On a boat trip along the canals we will soak up the vibrant atmosphere of local people going about their daily business of fishing, washing clothes and cooking pots to a backdrop of birdsong and a tangle of tropical plants along the banks of the waterways. From here we will travel to the green hills of Periyar. After settling into our hotel we will set off to explore the local life and colour. We will head off early next morning to Chellar Kovil region, and to a tea plantation with a spectacular high viewpoint. Our next base is at Munnar at the confluence of three mountain streams surrounded by about 30 tea estates, among the highest in the world. Here we will paint elephants and take an optional boat-ride tour, or jungle walk. Our fourth stay is in Fort Kochi, the palm-green commercial town of Kerala boasting one of the finest natural harbours in the world. Here we will visit the Dutch Palace, St Francis’ Church, and paint the fishermen operating the famous Chinese fishing nets. The holiday is for painters of all levels of experience in the medium of their choice, and as the group will be small, they will be assured of plenty of individual one-to-one tuition.